TUCSON, Ariz. -- The team operating NASA's Phoenix Mars Lander plans to instruct the spacecraft in the next few days to use its Robotic Arm to sprinkle a spoonful of Martian soil onto a wheel that will rotate the sample into place for viewing by the spacecraft's Optical Microscope. Meanwhile, commands for Phoenix's activities today are to continue a set of atmosphere observations begun during the Martian evening earlier Tuesday in coordination with overhead passes of NASA's Mars Reconnaissance Orbiter. These take advantage of opportunities for instruments on Phoenix and on the orbiter to examine the same column of atmosphere simultaneously from above and below. "It allows us to put the Phoenix measurements into global perspective and gives a ground level calibration for the orbiter's measurements," said Phoenix Project Scientist Leslie Tamppari of NASA's Jet Propulsion Laboratory, Pasadena, Calif.
On Monday, Phoenix tested delivering Martian soil by sprinkling it rather than dumping it. The positive result prompted researchers not only to proceed with plans for delivery to the microscope, but also to plan on sprinkling a sample in the near future into one of the eight ovens of an instrument that bakes and sniffs samples, the Thermal and Evolved-Gas Analyzer, or TEGA. A sample of clumpy soil dumped onto one TEGA oven on June 6 has yielded only a few particles passing through a mesh screen over the opening to the oven, even after additional vibration of the screen on Monday. The sprinkling method developed a few months ago by members of Phoenix's arm and microscope teams uses vibration of the tilted scoop by a motorized rasp to gently jostle some material out, instead of turning the scoop over to empty it. The rasp is located on the back of the scoop and will be used later in the mission to scrape up samples of subsurface ice. The first test of the sprinkling method Monday produced a layer of fine particles extending from a pile of about a tablespoon of soil. The practice placed the material on the top surface of the instrument suite that includes the microscope, the Microscopy, Electrochemistry and Conductivity Analyzer, or MECA. "This is good news," said Ray Arvidson of Washington University in St. Louis, lead scientist for the Robotic Arm. 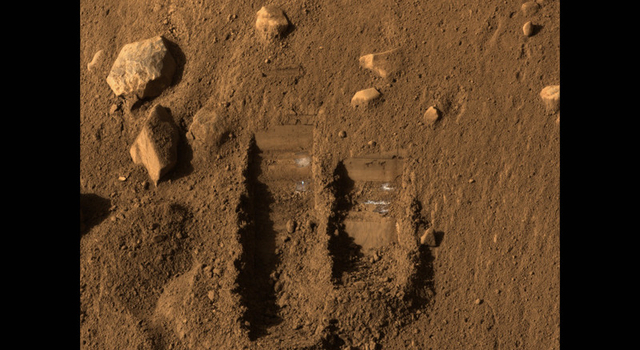 He said that the clumping tendency of Martian soil at the Phoenix site and some earlier landing sites comes from extremely fine particles filling in gaps between coarser, sand-size particles, perhaps together with an ingredient acting to cement particles together. Future soil samples may be prepared prior to delivery by chopping and scraping them with blades on the scoop. The Phoenix mission is led by Peter Smith at the University of Arizona with project management at JPL and development partnership at Lockheed Martin, Denver. International contributions come from the Canadian Space Agency; the University of Neuchatel, Switzerland; the universities of Copenhagen and Aarhus, Denmark; Max Planck Institute, Germany; and the Finnish Meteorological Institute. For more about Phoenix, visit: http://www.nasa.gov/phoenix and http://phoenix.lpl.arizona.edu.